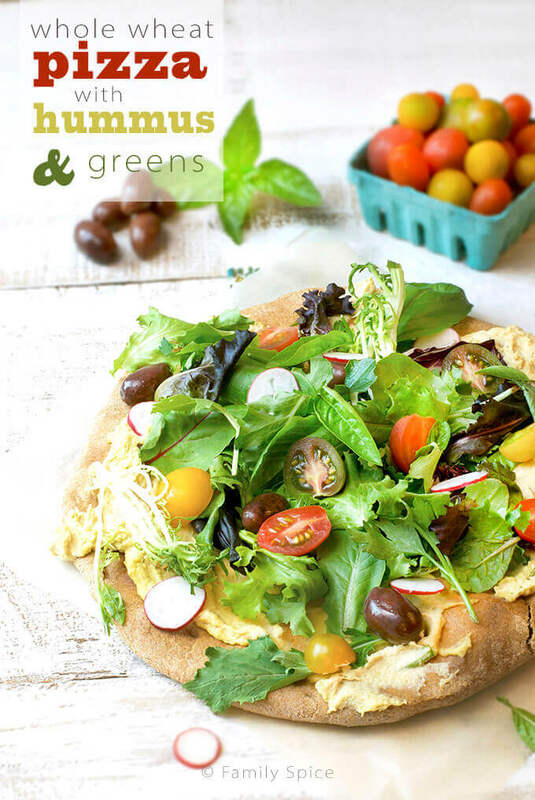 Back-to-school meals can be made healthy and in a flash with this Whole Wheat Pizza with Hummus and Greens. The kids are back in school! Woot! But, you’d think things would calm down in my house. Not quite! I have two schools this year and that means two car pools and two fundraisers entities trying to get into my wallet. While I’m trying to balance volunteering, blogging & home life I am just like everyone else trying to get dinner on the table. And that is why today’s #SundaySupper is all about back-to-school meals! One of our families favorite meals is a no-brainer, pizza. Seriously which family doesn’t love pizza? It’s versatile and adaptable. You can make it kid-friendly or healthy. I typically make one for the kids and one for the hubby and I. Don’t get me wrong, I like a slice of cheesy pizza, but sometimes you want something lighter, something healthier. My favorite way to serve pizza is with a salad. I love topping each pizza bite with the tangy greens. I mop up the dressing on my plate with the crust. Mmmmm….. I have made several attempts on a whole wheat pizza crust, but many have turned out to be bricks that were immediately thrown out. Whole wheat flour can be tricky and it soaks up a lot of moisture. With the help of some whole wheat flour sent to me by Bob’s Red Mill, my latest dough turned out to be a success. Lay on the cheese and pepperoni or add goat cheese and veggies. Go crazy, go healthy! I baked my whole wheat pizza crust plain and then smeared on my hubby’s famous Garlic Hummus. Because I love salad and vinaigrette with my pizza, I added it on top, too. Set yeast mixture aside for 5 minutes. Using a fork or your fingers, gradually mix everything together. Mixture will be a little sticky. Add little bit of flour as needed, while you continuously knead the dough until it is soft and smooth, about 20-30 minutes. Roll the dough into a ball and place in a bowl dusted with flour and cover with a clean dish towel. Place the bowl in a warm spot to rise until doubled in size, 1 1/2 to 2 hours. Roll the dough into a 10 to 12 inch circle and transfer to a pan. Add toppings and bake until golden 10-12 minutes. Serving Suggestions: Serve alone or with salad. Even better, top your pizza with salad! Cooking Tips: The dough can also be prepared in a bread machine, made ahead and chilled in the refrigerator until ready to use. Just bring dough back to room temperature before baking. You can also bake it without any toppings, as in the above pictured hummus pizza, for 8-10 minutes. Let dough cool for 5 minutes then spread with hummus and top with fresh greens. To prepare above pizza, bake pizza crust alone then remove from oven and schmear on your favorite hummus and top with salad. You can make the dough ahead of time or in the bread machine. You can buy prepackaged dough or pre-baked crust. Once you have the dough, it’s a meal that is ready in less than 15 minutes! And I am a happy momma – even during the school year. What are your favorite 30-minute-or-less meal options? 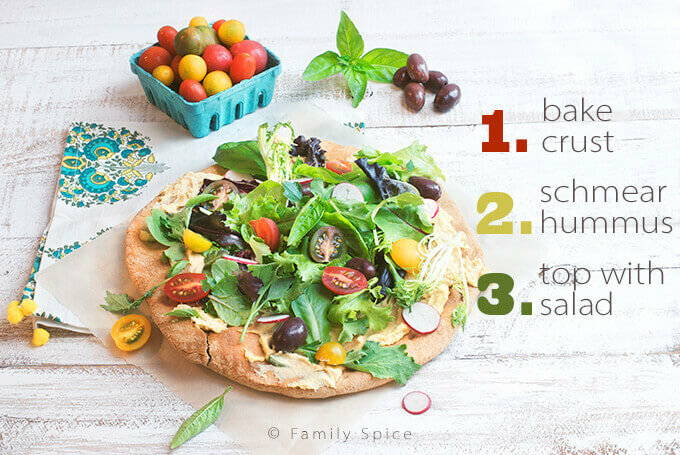 Hummus pizza – Oh yea! I’ll take the whole thing please and thank you! Hummus and whole wheat dough sound fantastic! Love the idea. Happy Sunday! I’m loving this pizza! Adding hummus is a great idea! Yum! Your idea of putting hummus on there makes me think of an even faster version — pita — for those nights when baking a pizza crust is even too time consuming! Gorgeous pizza!!! I’ve never had whole wheat dough but this is irresistable! Love the idea of garlic hummus on pizza. Brilliant. And you’re right that whole wheat doughs can be tough to handle sometimes. This looks great – and so healthy! Good stuff – thank you. Garlic hummus on a pizza with whole-wheat crust? Yes, please! This looks like the perfect pizza to me. I have always liked lots of green salad leaves on my pizzas, which others think is a bit strange. What a lovely meal. 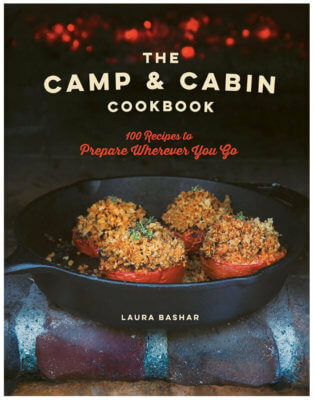 All I need to make this is the hummus and pizza dough. I’m growing cherry tomatoes and baby greens in the garden. This recipe is a wonderful way to celebrate fresh fresh produce! Mmmmm…that looks amazing. I often make a similar pizza but right on a ww pita. I need to try that dough, it looks so good. Beautiful photos, too! What a delicious looking pizza!! I love making different pizza’s, thanks for the great ideas!! Love your post and I can’t wait to try and I will be trying your recipe after converting it to gluten free. Well, there’s pizza and pizza, isn’t there: one surely can’t buy this at Pizza Hut 🙂 ! Have to copy: thanks!! What a beautiful looking pizza – and healthy too, what more could you ask for?! Wow that looks so good!Why have I never thought to use hummus on pizza?! This is right up my alley. I love a pizza like this!! It took me quite a while to perfect my whole wheat pizza dough as well. I love the addition of hummus to the pizza. I will have to give that a try next time. Can I just fold that over like a New York style pizza and shove it in my face? Love all the flavor combinations! That looks delish! I never would have thought to put hummus on pizza, so now I’ll have to try it! I love the idea of using hummus on pizza. So much flavor, and good for you too! Great new pizza idea! Love it! Beautiful photos! Is that all natural lighting? LOVE this spin on the pizza with hummus! Thanks for sharing!